Outreach is nothing but an effort to bring your referral program to customers.It is the best way to leverage the potential of your happy customers to spread word of mouth.It helps to invite your happy customers to refer their friends. Identify happy customers (who are very likely to refer your product to friends) through Good NPS or Best CSAT survey or any other custom metric and hit our API to trigger the outreach campaign.Referral program success depends on how easy it is for your customers to invite their friends and letting them know about referral program at right point of time. You can configure any of your existing outreach channel(like Customer.io, Gmail, Intercom or SMTP) to send the email. Select SMTP in Outreach Email page and click on save and continue, it navigates you to the configuration page. Email account LOV will display all the email accounts you have added to the app (in App settings–>Email ). Select the appropriate email account from the LOV. Enter from name. Turn on the status.You can edit or modify the default subject and intro message provided and then click on save.Now you have configured SMTP outreach.Similarly, you can configure for saas campaign as well. You can see the preview of how your outreach mail will appear to the user. Once you are done creating the template for your outreach mail, click on the Preview button from below the mail template, which would show you how exactly your outreach mail would appear to the user. With the help of Preview option, you can check the outreach mail template’s content, formatting, etc and make changes to the template accordingly if required. Click on the Preview button from below the outreach mail template, this would open up the preview window. Enter the site id and API key and click on connect, now your customer.io outreach is connected. click on save and continue and configure the outreach template. Enter from name and turn on the status and you can edit or modify the subject and Intro message and click on save. If you want to verify how the mail was sent using customer.io outreach, you can click on the test and enter emailid and click on send. You can check the mail sent to the user. Select Gmail in Outreach Email page, you will see a popup where you have to enter the Gmail account details and connect. 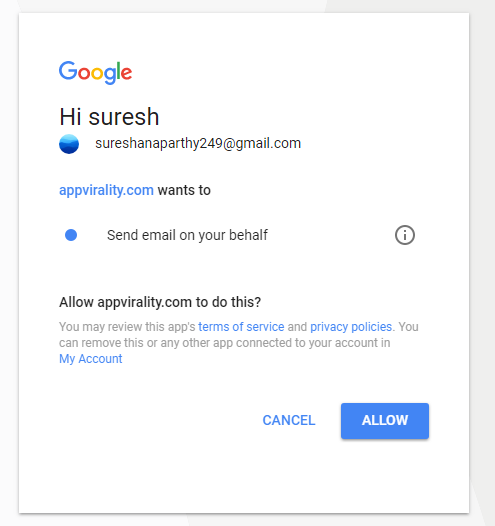 Now you have to allow appvirality to send an email by clicking on allow ( as shown in below screenshot). After clicking on allow you will be connected to Gmail outreach. click on save and continue and configure the outreach template. Enter the first name and Turn on the status and you can edit or modify the subject and Intro message and click on save. If you want to verify how the mail was sent using Gmail outreach, you can click on the test and enter emailid and click on send. 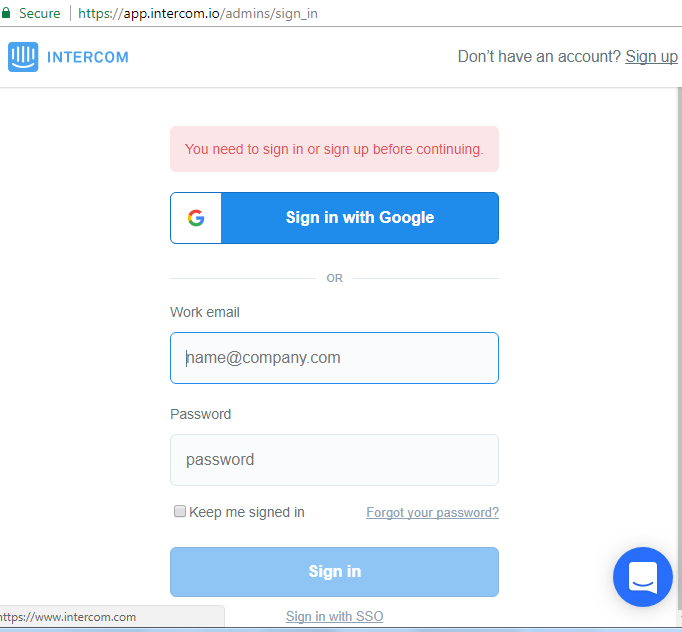 Select Intercom in Outreach Email page, you will see a popup where it asks for the intercom login details. Enter the valid intercom login details and sign in. Once you see the green tick mark on the intercom, you were connected to the intercom. Click on save and continue to configure outreach settings. Enter the first name and Turn on the status and you can edit or modify the subject and Intro message then click on save. If you want to verify how the mail was sent using Intercom outreach, you can click on the test and enter emailid and click on send. Once after configuring any of the outreach channels, you can trigger outreach using the below APIs for both in-app and saas respectively so that emails will be sent to the users. we have API for both in-app and saas outreach. Click on appropriate links to get the information about API. Once after sending emails through outreach, you can find all the stats like for how many users emails sent and the number of users clicked on referral link and click rate and click date etc in outreach tab in analytics. Go to Analytics tab in the left navigation bar and click on outreach tab.